It is acceptable to train the fans into a single plane, using long bamboo sticks or skewers. It takes several weeks to train the leaves into position. Be sure to remove the sticks prior to exhibition! Prior to exhibition, Fukiran should be re-mossed so that they are presented with fresh clean moss. The picture shows an example of a newly mossed Fukiran. Normally all longer roots are put back within the moss mound. 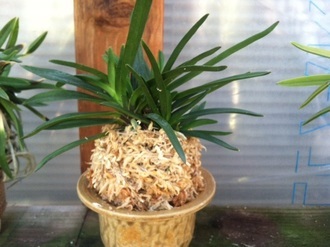 If the plant has newly emerging roots from the base, they should be left exposed, especially if the root tips are red. The "face" or front of the plant should be presented. The plant should be centered around one of the 3 feet of a traditional Fukiran pot. The label is also placed vertically on the forward foot. Gently wipe the leaves so that they are clean. Remove any old bloom spikes to the base. Remove any dead or yellow leaves. Clip any errant strands of moss so the moss mound is smooth all around. Slip the plant from the growing pot to the exhibition pot, ensuring the plant is facing one of the pot feet, with the label at the same foot.